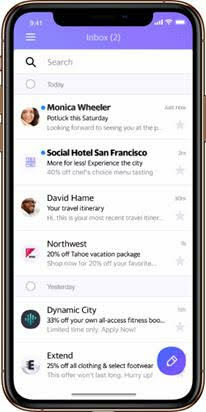 Yahoo Mail has added new features to help users manage their email inboxes as efficiently as possible. The two new features: Reminders and Unsubscribe, will bring more organization and less clutter, offering a more seamless mailing experience for users worldwide. Users can now set reminders within emails to prioritize what matters the most to them. Real life example: just opened an email about the utility bill that’s due soon? Set a reminder to pay it in five days, and a notification will pop up then. This feature has a notes section to add text and can be set for a specific date and time in the future. To enable a quick set up, Reminders suggests which emails should have reminders and recommends timing, all based on email content. Reminders can always be edited, updated and deleted at any time through a “Manage Reminder” option. Plus, users can view inactive ones whenever they want. The Unsubscribe feature helps keep inboxes clean and filled only with relevant content, making the entire unsubscribe process quick, efficient and stress-free. E-newsletter senders and email marketers should also find a benefit, as they’ll see a reduction in spam votes and be incentivized to deliver engaging high-quality content, since readers who are no longer interested will quickly be able to unsubscribe. Both of these new features are available across iOS and Android. Also, Yahoo Mail is going to add more feature updates in the very near future, such as an unsubscribe recommendation option, where users can opt to receive automatic recommendations around which emails to unsubscribe from.